Session 3 starts off with ties, dots and eight notes; however, like I mentioned in the last Walk Through, I won't be going over reading music for the sake of time and space. I guess if you want to learn, you'll just have the get the course! The third string is also known as the G string. That's because, when played open, it plays the G note. This string is easy because there are only two notes to learn in the first position. The only other note on this string in the first position, is an A. See the tab and finger chart on the right to see the correct finger placement. 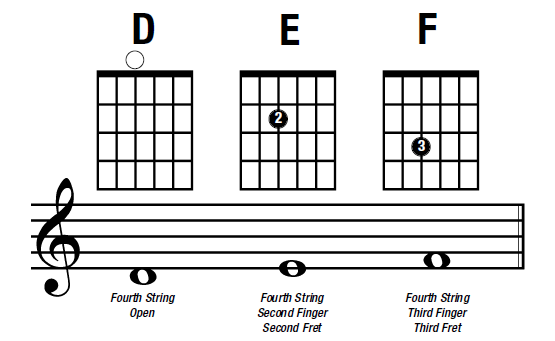 Below are a couple of G-string exercises that will help you learn and memorize the notes on the third string. Remember, these exercises are very important because they build finger strength, they help you learn the notes on the string and they build the correct "finger memory" into your fingers so they know where to go without you having to think about it. After an easy, two-note, third string, we're back to three notes on the fourth, or D string. The three notes are the open D, second finger E and third finger F. If you've noticed that we're beginning to see notes again, you're right! We've moved down an octave and are repeating notes lower on the staff. We learned D, E, F an G (on the third string) back in Session 2. 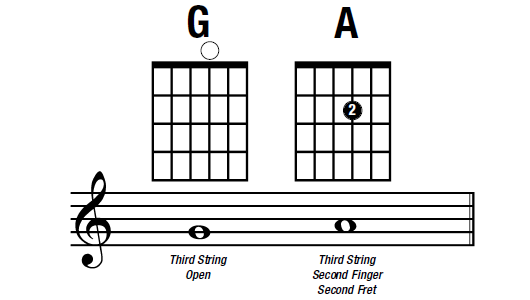 The D is also played on the second string (third finger) and the E, F and G are all on the first string. Remember, there are only 7 notes in total (not including sharps and flats) so we will be repeating notes on certain strings as we move down the staff. Continue to practice the notes on all strings. These exercises, as I've said before, are the foundation for your finger independence and memory. The finger exercises, especially the scales, are great warm-up exercises whenever you sit down to play. Even accomplished guitarists use similar warm-up scales and exercises before they play. It helps reacquaint your fingers with the notes and strings. I'd like to leave you with a recent addition to our on-going efforts to support and encourage students as you progress through the course. This is called Roadside Assistance, and is an email series sent to you at appropriate times as you notify us on the Student Support Forum (on the right side of your profile page) of what session you are on. If you're not getting these emails, simply register on our forum and indicate what session you are on in your profile.